One of the many advantages of buying an SUV over a car is that they typically have more passenger room. This is especially important for tall drivers as they need more headroom and legroom than others. Added hip room is also a bonus. But tall SUV buyers also usually want an affordable model. We look at the best SUVs for tall people for less than $25,000. At this price, buyers are mainly looking at compact SUVs but a few midsize models can be considered. 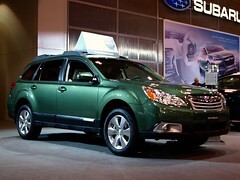 The 2011 Subaru Outback has a starting MSRP of $23,195, making it one of the few midsize SUVs that cost below $25,000. Its added size gives it an edge against its compact competitors. While the Outback has about average front headroom of 40.8 inches, with its 43 inches of front leg room, it is great for people with long legs. The Outback also has above average hip room of 54.5 inches. The Outback was redesigned for 2010, when it was named the Motor Trend SUV of the Year. Noticing a trend with Subarus? The Forester, which is the Japanese automaker’s compact SUV, has an even more impressive 43.1 inches of legroom. The model does have less headroom (40.4 inches) and hip room (52.9 inches) than the Outback. 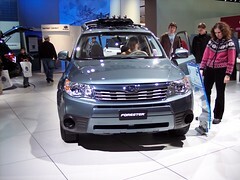 The Forester was the 2009 Motor Trend SUV of the Year. 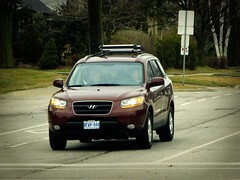 The 2012 Hyundai Santa Fe GLS has an MSRP of $23,225. It is the Korean automaker’s midsize SUV model. The Santa Fe has a spacious 42.6 inches of legroom. While the model has average head room of 40.4 inches, it excels in hip room at 55.8” and shoulder room at 59.5”. 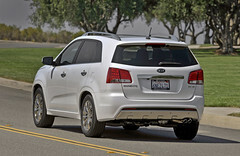 The 2012 Kia Sorento, a midsize SUV that has a starting price of $23,150, shines in front hip room and shoulder room. It has interior dimensions of 56.3” and 59.3” in these categories, which is quite spacious. The Sorento would be a good choice for an overweight driver, or a thickly built, broad shouldered driver. However, its headroom is a little below average and its legroom is about average. The Nissan Rogue is a compact SUV that has above average for its class 42.5 inches of legroom. The Rogue’s front headroom is 40.4 inches and front hip room of 53.1 inches. The best selling compact SUV in 2010, the Honda CR-V, has about average front headroom (40.9”) and legroom (41.3”) but it excels at hip room. The model has 55.9 inches in this dimension. The Hyundai Tucson has 55.5 inches of front hip room. The GMC Terrain has 55.1 inches of front hip room. The Jeep Liberty has a spacious 57.1″ of front shoulder room. The Nissan X-Terra also has above average interior room. It is a more traditional truck-based SUV. These best SUVs for tall people can make for a much more pleasant driving experience. Tall drivers with larger budgets can find more spacious SUVs in large crossovers and luxury models.